As a social marketer, you may want to upload video to your posts on Google+. Videos can be instructional, educational, or humorous. You can conduct interviews or product reviews or report live from an event. The possibilities are virtually endless and the most important part is that it’s yet another way to get you and your brand in front of your community. Copy and paste: You can copy and paste the link to a video, such as one appearing on YouTube or the mobile video-sharing site Viddy, by clicking the link icon. After you paste the link into the box, your video will automatically appear in the Share What’s New box. At this point you can choose whom to share the video with. Upload: Another option for sharing video is to upload one from your computer. Click the video icon to the right of the camera icon in the Share What’s New box and select Upload Video menu. 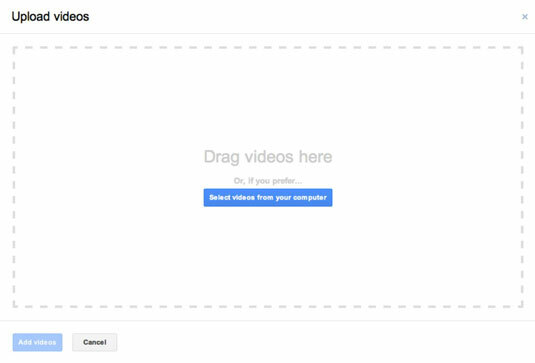 Navigate to the video on your computer and drag and drop it into the box or click the Select Videos from Your Computer button. After you’ve located the file, click the Add Videos button. 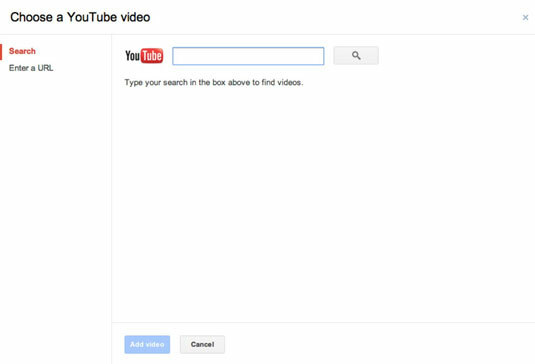 YouTube: This method for sharing videos is similar to the copy-and-paste method. If you click the video icon to the right of the camera in the Share What’s New box, you see the YouTube option. Clicking that option brings up the screen where you can search for a specific video by using search terms. To share the link from a YouTube video, click the Enter a URL link on the left of the window. You’re presented with a box where you can paste in a URL in the same manner as discussed in the first bullet. When you’ve found the video you want, click the Add Video button. Record: The final method for adding a video is by recording it directly using your webcam. You do this by clicking the video icon to the right of the camera icon in the Share What’s New box. Select Record Video from the drop-down menu. If you have either a built-in webcam or an external webcam, it will connect to the website and you will be able to start recording. We don’t recommend you record and upload a video this way, however. The video quality tends to be poor, and you do not have the ability to edit your video file as you would had you recorded it with a regular video camera. It also looks much more professional, and you want to put your company’s best food forward, right? For a quick way to upload a video directly from your computer, click the Videos button above the Share What’s New box and then click the Upload New Videos button. This method takes you directly to the drag-and-drop box mentioned in the Upload bullet in this section.